It’s June Dairy Month, and we’re celebrating with some of our fave facts about it – including cool science experiments and life hacks! 1. You can make “plastic” with milk. While milk is best as a beverage, it can also make a fun science experiment. Mix a cup of warm milk (zapped in the microwave for 90 seconds) with 4 tablespoons of vinegar. Stir it a few minutes, then strain and squeeze out the excess liquid. You’ll end up with a moldable “plastic” you can form into fun shapes. It hardens when it dries over a few days’ time! 2. Dairy has three out of the four nutrients kids are missing. 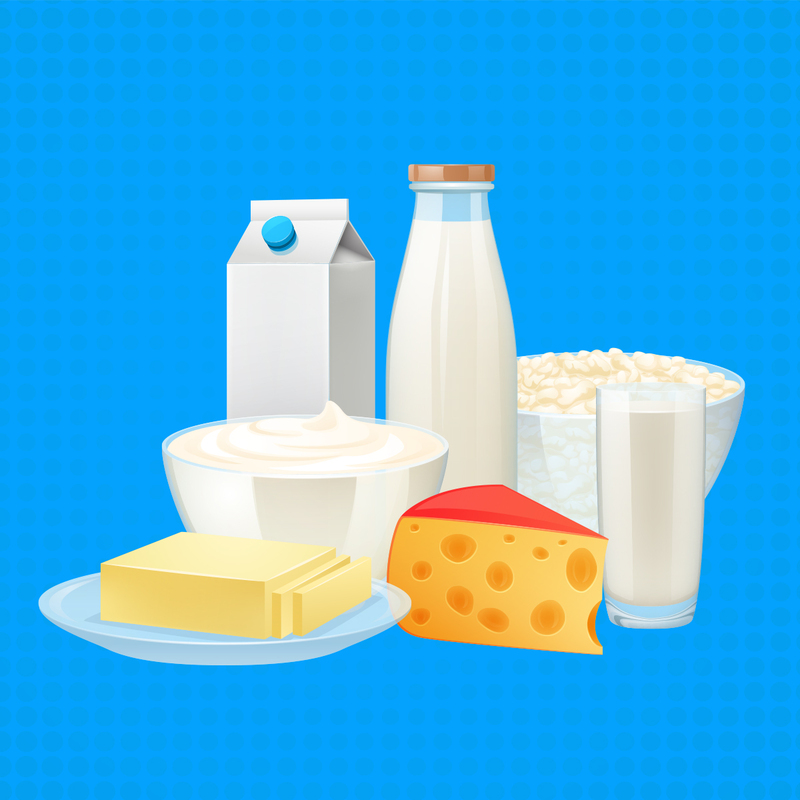 Dairy is a great source of calcium, potassium and vitamin D – all nutrients of concern. That’s why it’s so important to include milk, cheese and yogurt in school meals, especially breakfast. 3. Sometimes dairy cows save lives. Dairy farmer Anita van der Laan says her cow, Gemma, found her breast cancer early enough for her to get it treated. Read her story and four other heartwarming cow stories here. 4. All the sweet with less of the sugar. Chocolate milk is a student favorite, and an important source of essential nutrients for kids. Plus, the chocolate milk served in schools is specially formulated with less sugar, so you don’t have to worry about too many sweets for the kiddos. 5. String cheese theory. In the 1990s, British scientists conducted experiments to determine how various ages of cheddar cheese reacted to being compressed between two plates. They published their findings in the Journal of Materials Science as “A Study of the Influence of Ageing on the Mechanical Properties of Cheddar Cheese.” For real. And we thought we were cheese nerds! 6. Do you even lift? Turns out chocolate milk is the sports drink nature intended, full of natural electrolytes and the ideal carbs-to-protein ratio for muscle recovery. For best results, drink a glass about 30 minutes after working out. 7. Dairy invests in schools. Dairy MAX is really invested in our local public schools, supporting and implementing programs that teach kids how to form healthy habits. Check out the five things Dairy MAX is doing in schools. 8. Dairy’s got guts. Fermented dairy foods like yogurt and kefir contain probiotics – good bacteria that aids digestion (even for people who are lactose intolerant) and strengthens the immune system. 9. A UN organization declared June 1 to be World Milk Day. In 2001, the Food and Agriculture Organization of the United Nations (FAO) selected June 1 as World Milk Day, to celebrate dairy’s importance to sustainability, economic development, livelihoods and nutrition. 10. Super substitute. Plain Greek yogurt makes a great rich but healthy substitute for recipe ingredients like mayonnaise, sour cream and cream cheese. 11. Cottage cheese: the comeback kid. Creamy, salty cottage cheese is making a comeback on American tables – so versatile that it can be enjoyed sweet, with fruit or jam, or savory, with tomatoes and herbs. 12. Dairy MAX is the official nutrition partner of the Dallas Cowboys. We teamed up with the Cowboys to spread the word about the importance of nutrition to all the people who look up to these amazing athletes. 13. Sweet, portable, power-packed meal. We all want to get healthier, but we’re always busy, and it’s hard to find time for any breakfast, let alone a healthy one. Smoothies to the rescue! Five minutes with a blender and you’re good to go. Just make sure you use real dairy milk for nine essential nutrients including 8 grams of high-quality protein. 14. Beauty sleep. Beautiful breakfast. Speaking of quick breakfasts, how about overnight oats? Throw some oats into some milk, add whatever flavorful extras you like – fruit, cinnamon, peanut butter, cocoa powder – and stick it in your fridge overnight for a ready-to-eat meal by morning. 15. Skipping dairy is as bad as skipping leg day. Dairy is an easy, affordable, tasty way to get high-quality protein (try 8 grams per glass) in the form of casein and whey. One is absorbed slowly, the other quickly, to feed your body protein both long term and short term. 16. 95 percent of dairy farms are family-owned. Many dairy farms are passed down through several generations. 17. Whey is the way to go. Whey is an excellent source of leucine, known to stimulate muscle synthesis and decrease muscle soreness. Studies show that people who choose whey protein over soy protein build more lean muscle mass and have smaller waists. See whey stats and sources. 18. A reason to reinvent the (cheese) wheel. You can create a hollow in a cheese wheel, flambé it, and use it as a melty pasta-tossing bowl. 19. “Poets have been mysteriously silent on the subject of cheese,” G.K. Chesterton famously said. They were probably too busy eating it. 20. Cows were the first ones to be “over the moon.” The saying about being so happy you’re “over the moon” apparently comes from the nonsensical rhyme “Hey, diddle, diddle … the cow jumped over the moon.” Why did she jump over the moon? Was she trying to top the fiddle-playing cat? We can only guess. 21. That’s a latte milk. Every year, Starbucks uses enough milk to fill 155 Olympic-sized swimming pools. 22. Cheese plates can be as healthy as they are classy. Let’s face it: Cheese plates are about the classiest thing you can offer at a party. And while your guests snack on soft Brie and smoky Gouda, you can tell them all about a dietitian’s seven benefits of cheese. 23. Good nosh for your noggin. Research out of the University of Kansas Medical Center indicates people who drink more milk have higher levels of the antioxidant glutathione, which is good for brain health. 24. Dairy feeds the hungry. No, we don’t just mean milk makes a great midnight snack; milk is one of the most requested items in food banks, and the Great American Milk Drive is helping fill that need. Join the fight. 25. You can make ice cream without a churn. All you need (besides the ingredients) are zip-close baggies and salt. And maybe some duct tape. Here are the details. 26. You can make your own butter. Or is that “shake” your own butter? This is another fun experiment to do with your kids. Here’s how. 27. Dairy farmers work hard for the environment. Most farmers live on their farms, so it’s important to them to protect that land, air and water. Here are 14 ways they do it. Want to help? Here are some crafts you can do with recycled milk cartons. 28. You can make oatmeal (and more) with milk instead of water. Oatmeal, rice and condensed soup made with milk instead of water are like 500 percent more delicious (and they have more nutrients). Here’s the lowdown from Quaker. You’re welcome. 29. You can use milk to seal small cracks in china. The casein protein in milk can work as a plastic-like seal. Just place the cracked piece of china in a pot, cover with milk and heat on low for one hour. The crack will disappear and you’ll be able to use the china again (for cold items at least; hot liquid may dissolve the seal). 30. Dairy is tooth fairy–approved. The Academy of Pediatric Dentistry recommends cheese as a cavity-fighting snack – so after a sweet treat, make sure you snack on some cheddar cubes.